The Create Media Group team at the Dubai edition of the Wings For Life World Run in May 2016. In the initial growth phase of business, the natural emphasis and attention for any entrepreneur is on developing from a financial perspective. As a business matures, there becomes a greater responsibility to give back to employees, clients and the wider community. One of the most attractive aspects of a startup business is its culture. There is no big name above the door, but a true sense of community within an organization makes the difference when somebody is deciding where to spend their all too precious time. A recent study conducted by Archers, a brand and research consultancy based in Dubai, in collaboration with SWAT Research, found that the majority of companies believe that CSR programs act as an enabler for their employees in the workplace, and are willing to give days off to support charitable causes. The study, which comprised a group of 30 c-suite executives from different nationalities based in Dubai, aimed to assess management’s role in driving their employees to support charitable causes, understand the company’s level of support for these charitable causes, and gauge employees’ morale by giving them time off to support charitable causes. I absolutely believe that the environment rather than just the salary is the deciding factor for an employee when making workplace choices. Paying more attention to activities that both develop a culture of teamwork and are for the greater good boosts team morale and positively affects the bottom line. 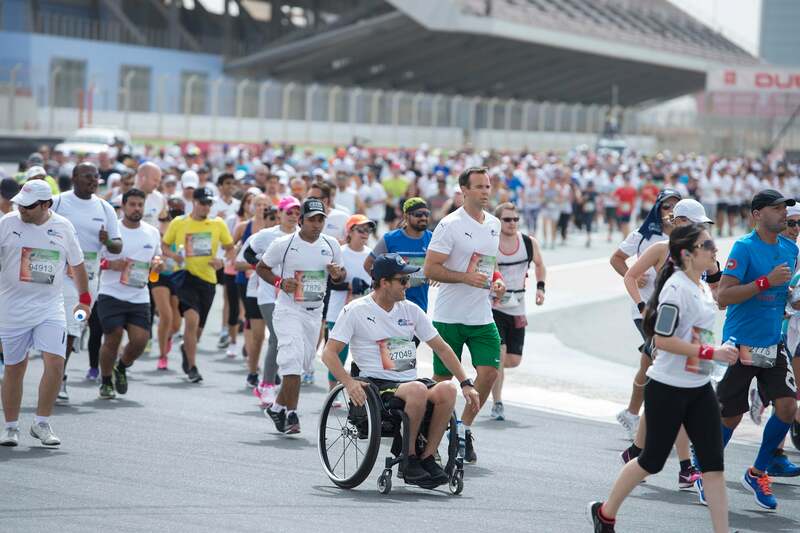 A scene from the Dubai edition of the Wings For Life World Run in May 2016. Image credit: Create Media Group. The overwhelming majority of respondents in the Archer’s survey associate charitable causes with two key societal elements: giving back to the community and empowering human values, with 67% and 50% of respondents thinking of these specific elements respectively. Self-satisfaction came in with just 23%, signaling an overwhelming inclination to support charitable causes for social reasons. The impact of CSR involvement, employers say, is increased positivity at work and an increased sense of gratitude (67% and 63% respectively), leading to a far happier workplace. When asked how employers accommodate charitable cause participation, close to 60% said they will give employees time off. Of these companies, 53% will give up to 2 days off, 24% up to 4 days off, and 12% more than 6 days off in order for team members to participate in CSR programs and charitable causes. Very early on at my company, Create Media Group, we saw CSR as a way to do business and it has allowed us to successfully build a brand that both customers and staff can relate to on a personal level. Our philosophy of making a difference is evident through the various projects we get involved, including Joining Jack, The Larchfield Organisation, and most recently, the Wings For Life World Run. On Sunday, May 8, 2016, the Create Media team teamed proudly joined another 130,700 runners in the Wings For Life World Run. The 6.6 million euros in proceeds from the global run go to help find a cure for spinal cord injuries, which affect millions of people around the world. Running for those who can’t, our team covered over 50 kilometers in soaring temperatures to raise money and awareness for this ground breaking global initiative. For us at Create Media Group, initiatives like these enable us to give back to the different communities we work with around the world. While economics is still important, businesses need to appreciate that our global landscape is changing. The increasing concern of environmental and social impacts means that to achieve long-term success, organizations must start looking towards the “triple bottom line,” i.e. profit, people and planet. The more people that can benefit from your company’s existence, the more successful you are as an entrepreneur. CSR is one of a few practices that can positively impact these three elements, and should therefore be closely aligned with your business strategy to ensure sustainable success.